Kickstart your ashtanga practice in the safest and more inspiring way. With one of the world most popular Ashtanga Teachers and Level 2 KPJAYI Authorized Laruga Glaser. For the first time on a video or dvd you have the opportunity of practicing a full Ashtanga Yoga Primary Series with world renowned Ashtanga Yoga practitioner and KPJAYI level II authorized teacher Laruga Glaser. make you ready for deeper yogic practice -- both physical and meditative. a yoga practice before attempting to perform its postures. Lalit is the founder of Himalaya Yoga Valley and has over 15 years experience teaching nationally and internationally. He is a keen Ashtanga Vinyasa practicioner and holds a Master Degree in Yoga education. Lalit began studying at traditional Indian yoga schools known as Gurukulams at the age of 7. He is honored to have studied yoga under some of the most well-known and respected yoga Masters in India: Shri BKS Iyenger, Shri K Pattabi Jois, Shri Sharath Jois. He has spent nearly a decade studying numerous traditional styles and disciplines at various Ashrams in North and South India. Lalit’s popular teaching style blends traditional Ashtanga Vinyasa Yoga with alignment techniques. He places a strong focus on to physical adjustments to improve alignment through a precise yet dynamic practice. A 25 minutes gentle dynamic sequence that will start from the sun salutations and move through Standing and Seated postures to activate the body for the rest of the day. A 25 minutes class intended focus in opening the hips, releasing tensions and improving flexibility in the area. A 16 minutes sequence focused on backbending that will gently help you to improve the flexibility of your spine in a safe way. A 31 minutes dynamic sequence that, starting from the Sun Salutations, will move you to some more challenging poses, with a dynamic flow that will help you to access to the natural strength and flexibility of your body. Mobilising the limbs, spine, joints. If you are feeling tired, this is a great practice - for example after work and before play. If you’ve had a busy day in a busy life, this is a good practice to re-connect body and mind. Tashi teaches with a keen sense of technical precision and also supports you with a huge dollop of love and gentle humour. Tashi also leads guided silent meditations, movement-based meditations and mantra chanting. The practice level is accessible for beginners as well as for advanced students. Dagmar Spremberg is the founder and director of Montezuma Yoga in Costa Rica. While growing up in Germany all she could envision for herself was living life in the sunshine and under the palm trees. After 20 years of soul searching and many detours that let her explore city life in Los Angeles and New York, she found her dream life by the beach in the lush & tropical nature of Costa Rica . Through her own experience she believes that everybody can live their dreams and that our work is to become clear and open to receive the gifts we all deserve. yogaDagmar is a 500hr E-RYT with the Yoga Alliance and trained in Vinyasa Flow, Anusara Yoga and Yin Yoga with teachers like Elena Brower, Rod Stryker and Paula Tursi. She is also a graduate of The Institute For Integrative Nutrition in New York and compliments her work with Holistic Health Coaching, helping her students to maintain a healthy, vibrant & balanced body. When not in her home in Montezuma, Dagmar travels with her life partner Gaudan to teach their signature Vinyasa flow & Hang music classes and retreats, that will lead you back to your flow, leaving you energized and excited about finding your unique gifts and creating your amazing life. Gaudan is a well known swiss renaissance artist with many creative skills in the areas of architecture, design and art. He had the courage to spend 12 years living off the grid in the Costa Rican jungle and found his inspiration and confidence in the intuitive connection with nature and stillness. Gaudan’s passionate stories inspire with confidence and trust in intuition, which he generously shares to encourage others to be willing to take risks and to embrace the unknown. When he fell in love with the Hang instrument in 2009 he discovered its soothing and relaxing effects to enhance Dagmar’s yoga, and soon they started leading worldwide classes and retreats together, complimenting each other beautifully. On “The Gaudan Project”, he cooperates with other musicians and performance artists to share the magic of the Hang music. 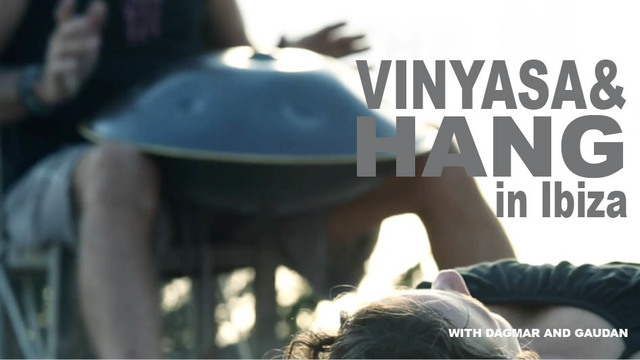 Vinyasa Flow and Hang music join together in the beautiful island of Ibiza, to create two beautiful sequences. Dagmar will gently guide you to open your shoulders and your hips, while Gaudan will play live the hang, creating a unique mix of magic. a copy of Jungle Bliss by Gaudan Project with the amazing hang music mixed with sounds from the tropical jungle of Costa Rica. Looking for space - enquiring into the possibility of lengthening into each movement - finding your spine - grounding through your feet and hands - flowing between simple postures - remaining fully present in the moment - feeling your way with smooth breath and soft lower back - luxuriating in the fluidity of the practice. Integrating more deeply into presence - mobilizing he body-mind-breath connection - mobilizing spine and the major joints - working with the body’s natural dynamic of integrity. Lely places more emphasis on the inner focus than physical effort, yet the experience is always surprisingly powerful and reflective. She is deeply knowledgeable and she has a wonderful knack of delivering truth in a way that makes it feel like one's own inner wisdom. The practice level is accessible for beginners as well as for advanced students. The intention of MY YOGA TV is simple: inspiring you to get on the mat and do yoga. Thanks to its wide collection of yoga images and videos and a selected choice of high quality online classes from different styles of yoga, your personal practice will thrive, nurtured by clear step to step instructions during the classes, and enhanced by the images of the world most amazing yoga practices. We don’t want to be your yoga teacher, but we hope we can inspire you to find one, or to stick with the one that you have already, with renewed motivation. Creating a community of people practicing yoga in different places, with different bodies, different teachers, different intentions, together as one. Making MY YOGA TV everyday a little more yours. MY YOGA TV has being created by Alessandro Sigismondi: photographer, videographer and yoga practitioner himself. 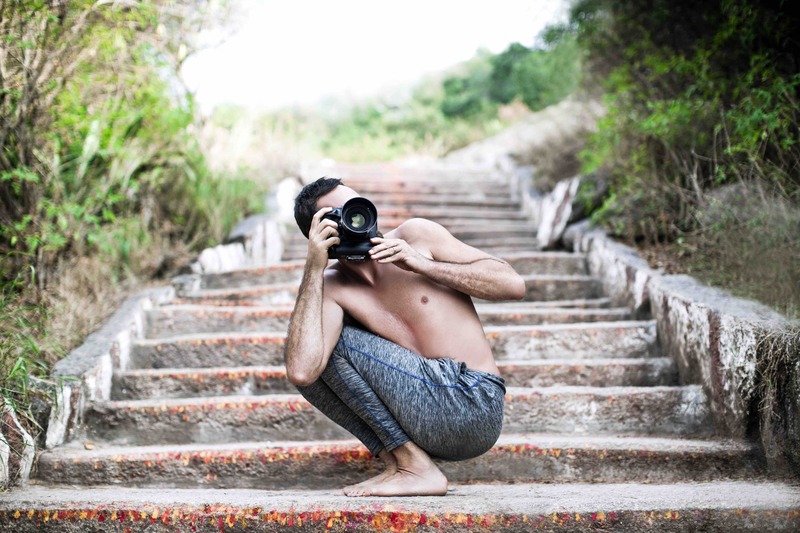 With 16 years of experience in the advertising market and 4 years dedicated to travel worldwide to film and photograph yoga teachers, retreats, studios and brands, Alessandro spends the rest of the time practicing Ashtanga Yoga in the early mornings, preferably in Mysore, where he has being authorised to teach by KPJAYI, or with his family: his wife Paula – also his assistant – and his son Leonardo.